King, Snohomish, Pierce, Thurston County Seattle, Bellevue, Sammamish, Issaquah, Redmond, Medina, Mercer Island, Newcastle, Kirkland, Renton, Tacoma, Olympia, Mukilteo, Snohomish, Everett & Beyond. For over 25 years, Property Owners and Home Owners in Madrona trust GHB Window Cleaning Services to maintain their properties and grounds with our professional pressure washing services. We can brighten your exterior grounds and building by pressure washing away dirt, grime, debris, moss & algae. Our eco-friendly pressure washing complies with all federal, state and local waste-water regulations. Get sparkling clean grounds, surfaces & buildings, guaranteed. We are licensed, bonded and insured. Clients include the Top Universities & Hotels in Madrona. Pressure Washing / Power Washing references are available upon request; our clients privacy and confidentiality is of utmost importance. What does pressure washing & power washing remove? Pressure washing removes moss and algae that can eventually deteriorate the surface and leave unwanted holes. Also, moss & algae are very slippery and proper cleaning of sidewalks, parking garages and parking lots can limit your liability for a fall related accident. Regular service can prevent moss and algae from growing. Why do commercial pressure washing? Commercial power washing and pressure washing is a great way to brighten up and clean parking lots, building exteriors, store fronts, awnings, sidewalks, curbs, new construction and more. It also can limit your liability for fall related accidents. What kind of equipment do you use for commercial pressure cleaning|power washing? We use industrial pressure washers ranging up to 4000PSI, hot and cold. 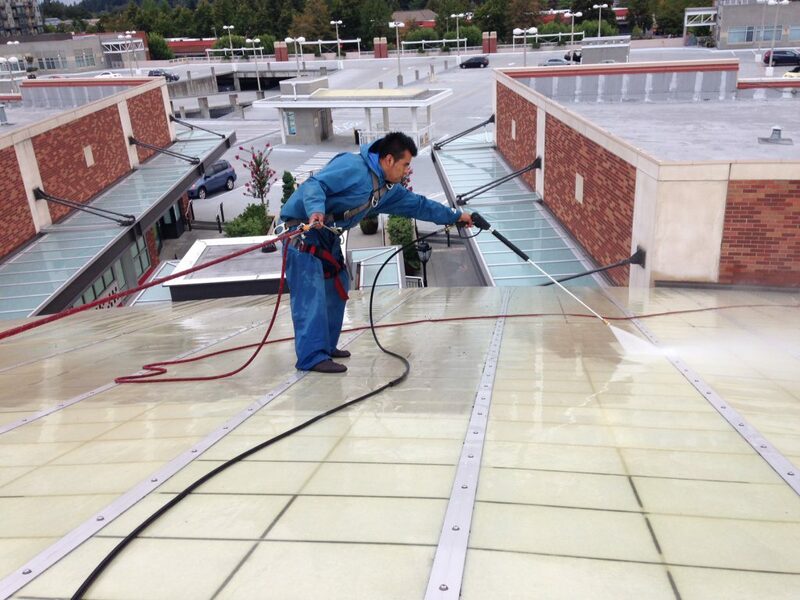 Are you insured for commercial power washing? Yes, we are licensed bonded and insured. Do you have references specifically from other commercial pressure cleaning client? Yes, we will be happy to provide references upon request. Our clients privacy and confidentially is very important to us. How much does it cost for commercial pressure washing|power washing? Prices vary based on square footage, height and degree of soiling. Call us at (425) 250-1044, or fill out our Free Online Estimate request form for a free custom estimate. Neat and Courteous Professionals. On time arrival, full uniforms and shoe covers. Proof of insurance upon request and references. All employees have gone through extensive background checks. Clearly the right choice you can trust for your home and property. Clearly the Right Choice! Suddenly the idea of Clean Windows, Clean Gutters & Clean Roofs all year round became a whole lot clearer! GHB Window Cleaning knows that first impressions are lasting and when your building has clean windows, people notice. With over 25 years of experience, you can rely on our fast, professional on time service!